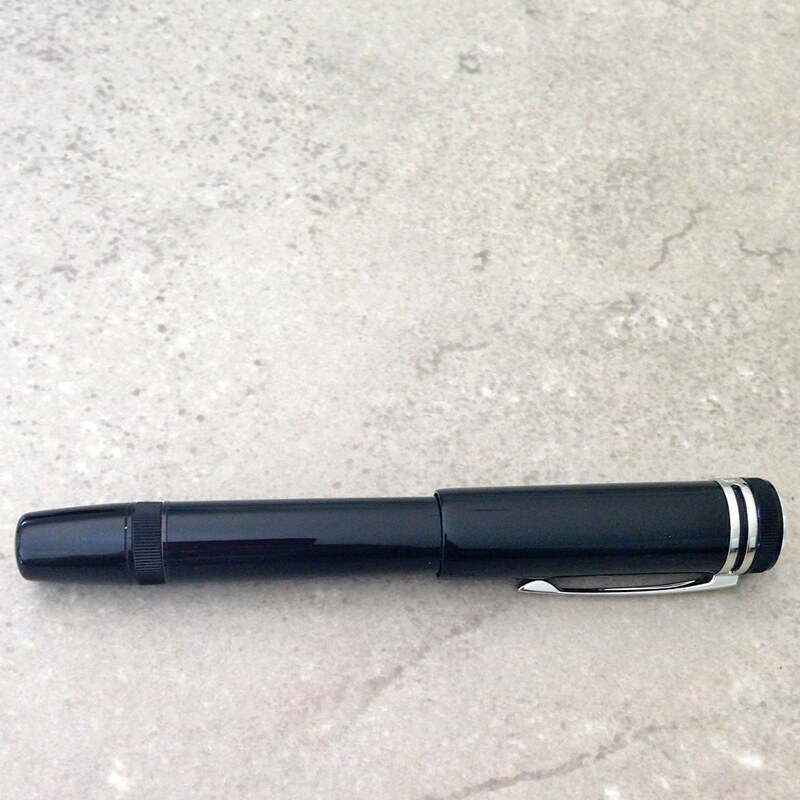 Like any normal fountain pen lover, there are a great number of pens that I have my eyes on at any given time. 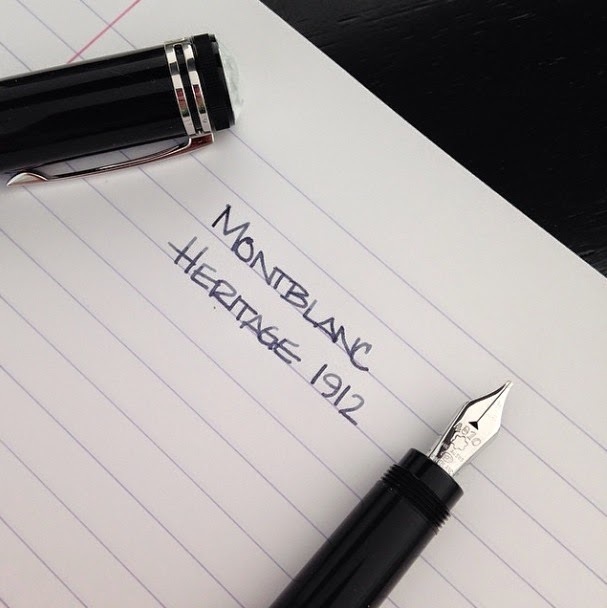 When the Montblanc Heritage 1912 pen was released, I knew I was attracted to it and I knew right away that it would find its way to my wish list, but I didn't know I'd end up with it! I mean, seriously, look at this thing . . . I received this pen as a late Christmas gift from a friend. When I opened the wrapping and saw the box, I'm pretty sure I gasped. Or maybe squealed. Probably both. About the Heritage 1912 . . . 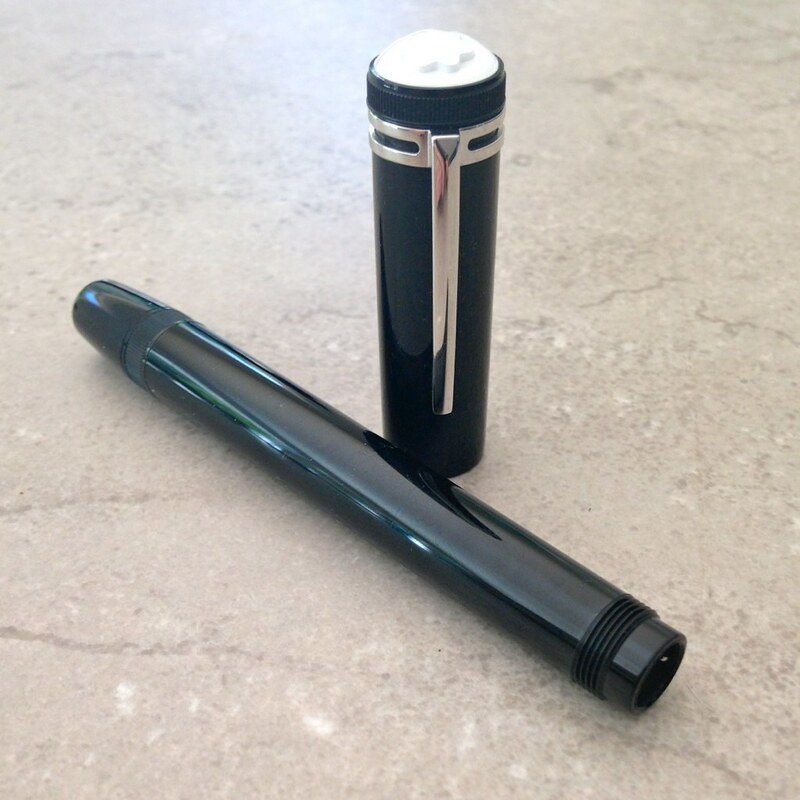 The design is inspired by the Montblanc Simplo Safety Filler - one of the first fountain pens. (Crazy, right?) 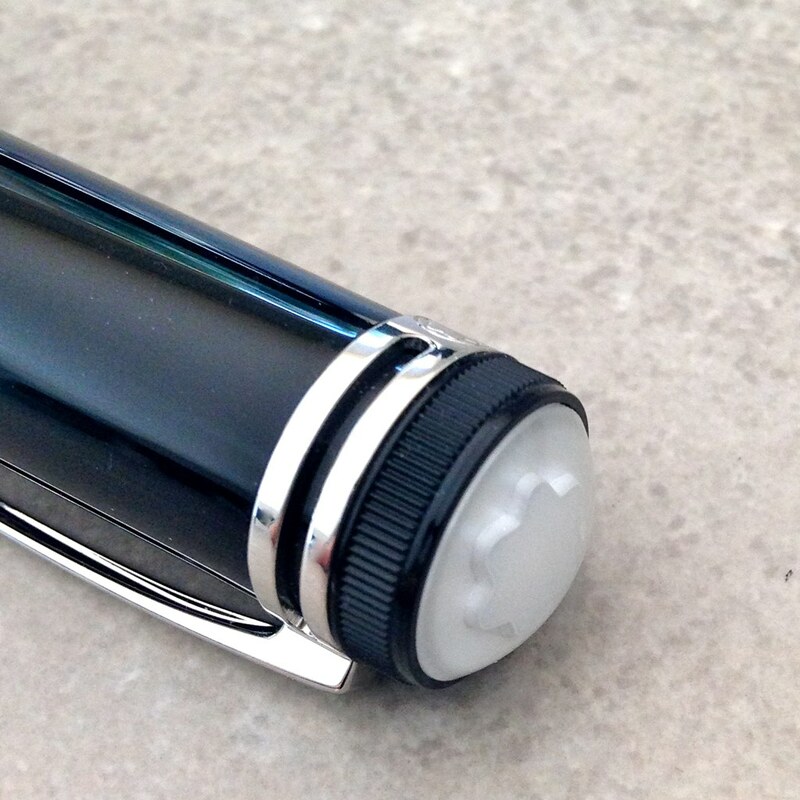 The Simplo was small in size, had a retractable nib, was made of hard rubber, and had a rounded white-tipped cap. I actually held one of these at a pen show a long time ago. 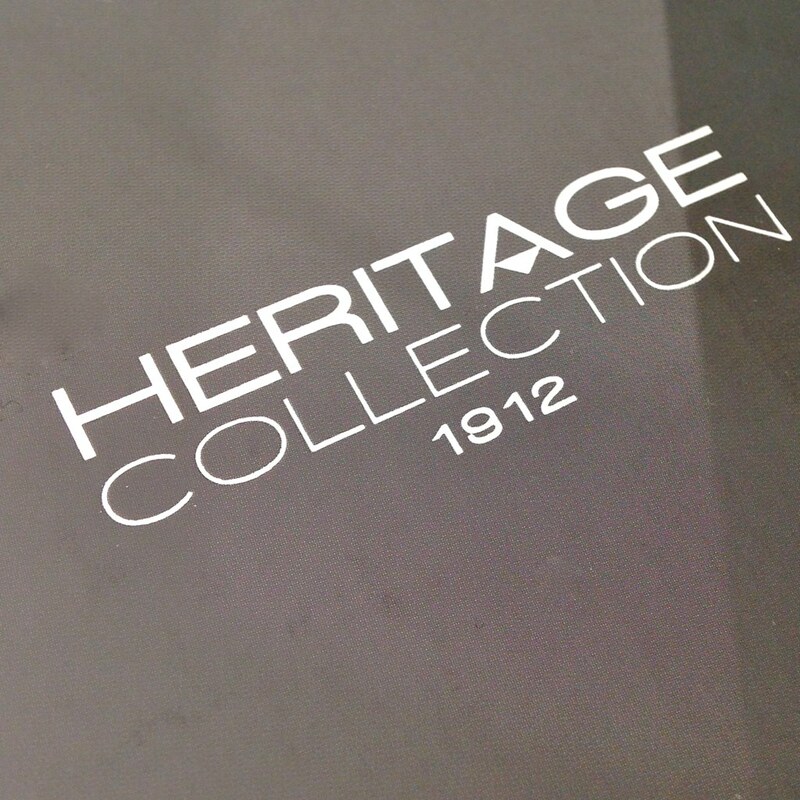 The original Heritage 1912 was a limited edition of just 333 pieces and was made of titanium. It's gorgeous, but has a scary (for most people) price tag. 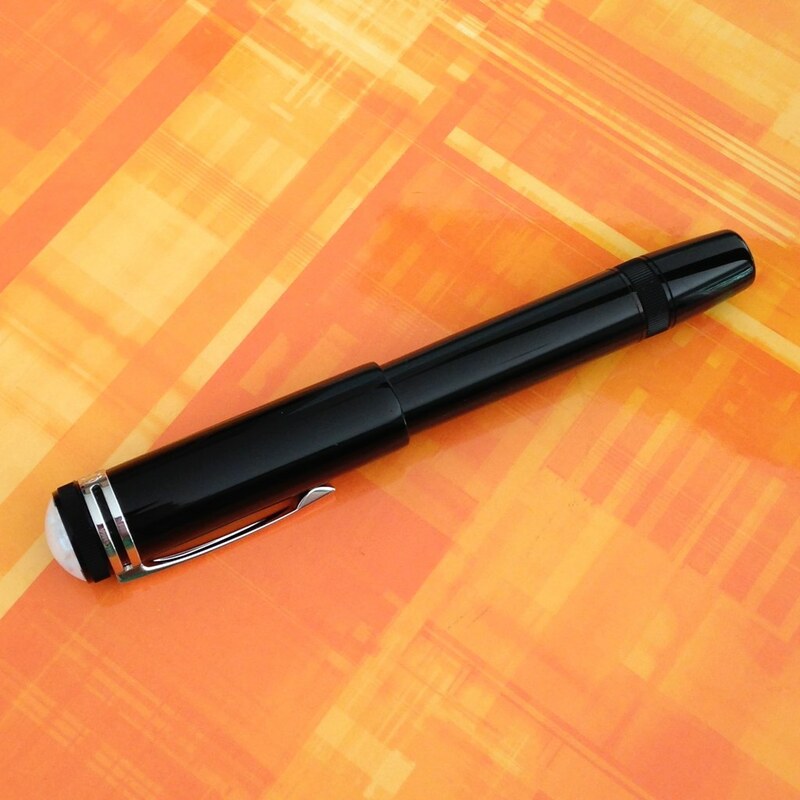 This precious black resin version of the pen has similar qualities . . . It's a beauty. And then I wrote with it . . .
A Pragmatic Look . . . I'll let someone else do all of the weights and measures. I'm more about how it looks, feels, and writes. Design - love it. Very stylish, classic. I've always been attracted to retractable nibs. This pen has a sleekness to it that isn't often found. There's a thingy in the cap to prevent the user from ruining the nib if the cap is replaced without first retracting the nib. Well, there is one issue with performance - the pen is not meant to be posted. 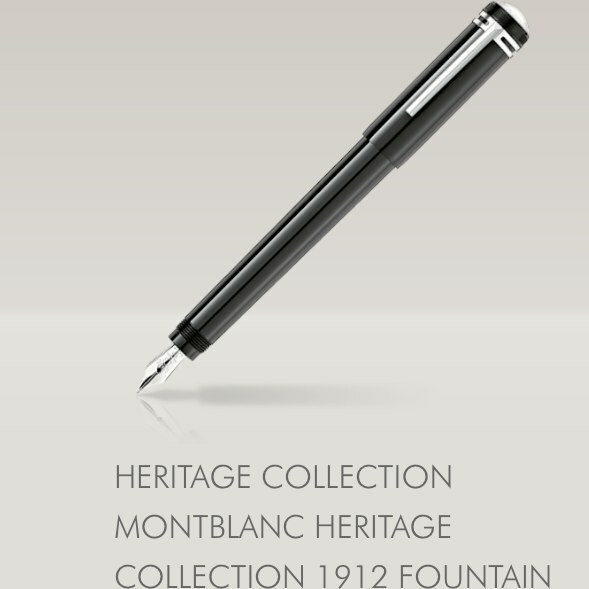 Ironic given the picture above that I pulled from the Montblanc website, yes? 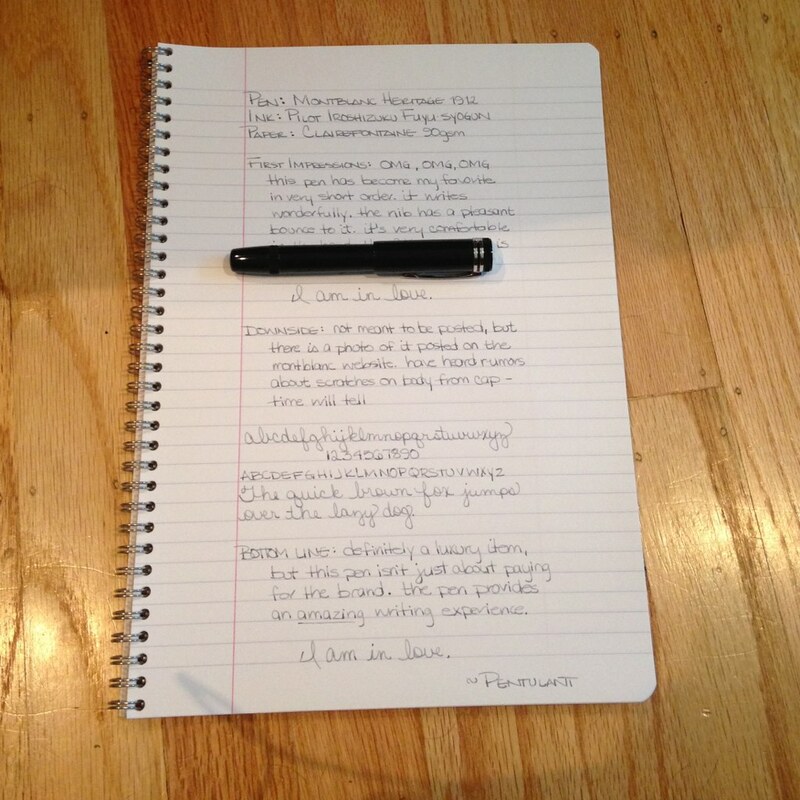 Normally, this would be a deal breaker for me (I always post), but I love the pen and the writing experience so much that this is a complete non-issue. When attempting to post, the cap is loose and the pen is unbalanced - I do not think anyone could post the cap and be happy with it even if it were possible to do so (which it's not). 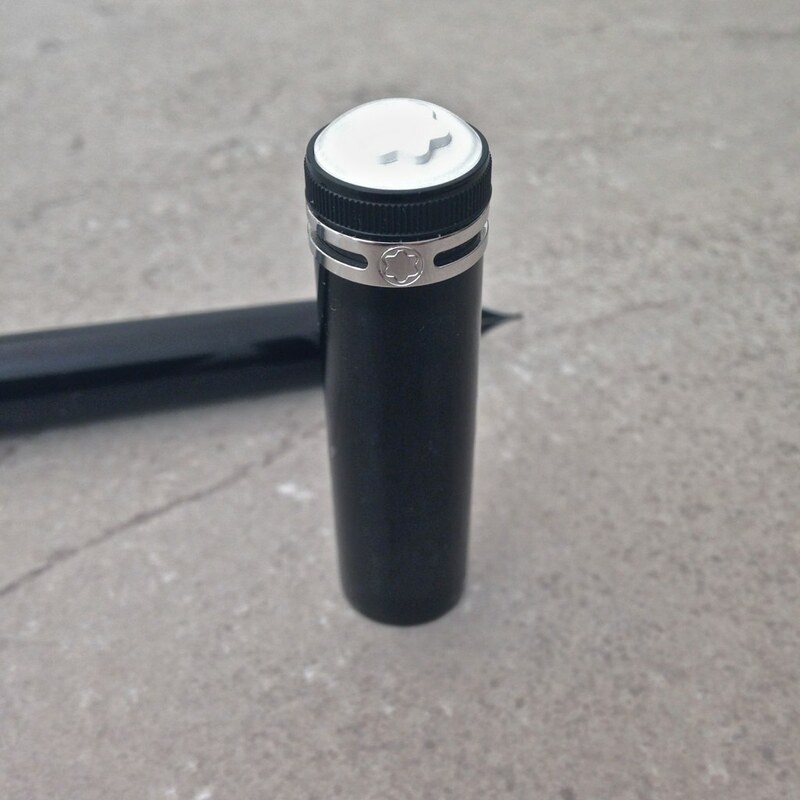 Practicality - the Heritage 1912 will be an everyday writer for me. I am not overly careful with my pens and I don't flip out if a scratch appears. If I worked in an office, I probably would not take it with me because it would be too expensive to replace and I'd cry if it became lost/stolen. For me, the pen is very practical. However, there are some reports that the pen scratches easily and that the cap rubs and causes "rings" to appear on the body of the pen. My guess is that the resin itself isn't anymore likely to scratch than other MB pens, but that there is long expanse of resin and that scratches are more noticeable. If this kind of thing is going to bother you, you may disagree with my assessment on practicality. Some Bonus Pics . . . I also want to toot my own horn a little. I love Instagram and am happy to have so many friends over there - more than 400 now, which isn't a lot to some people, but feels like bunches to me. A few days before I started posting pictures of the Heritage 1912 fountain pen, this came up on my news feed . . .
Wooo! Maybe they follow everyone - I don't know, I don't want to know - haha. But Montblanc is following me on Instagram and I feel pretty giddy about it. I'm pretty sure this means that you should also be following me there. I'm Pentulant on Instagram. And, finally, it's clear that I love this pen, but you should read as much about it before you run out and get one of your own. 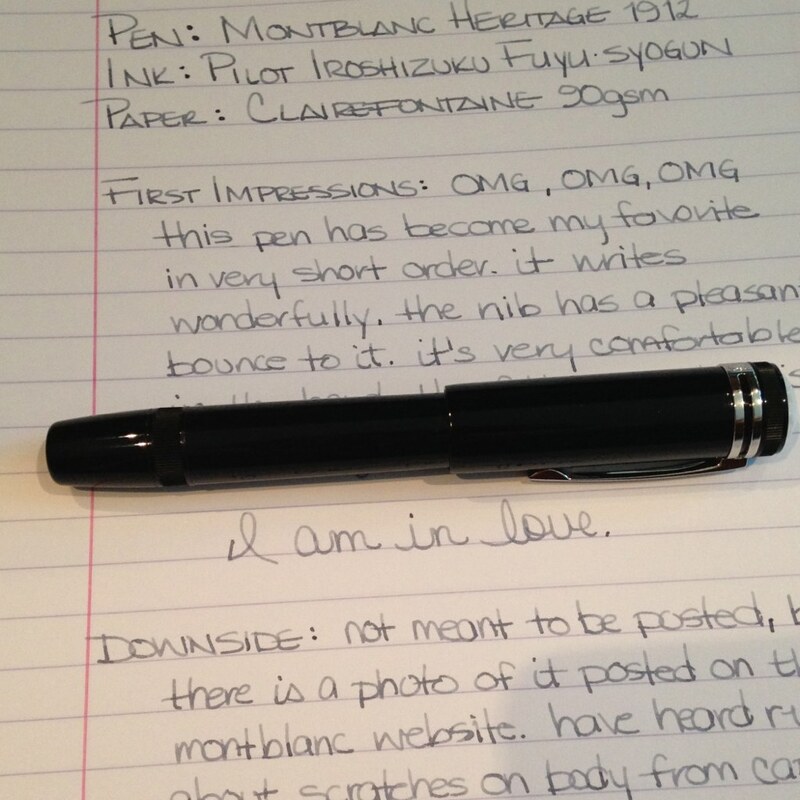 It's not quite the same as buying a Pilot Metropolitan (which I also love!). I've put together the following resource list. One question, do you know how much ink it holds? I was rather surprised when I flushed the pen with water initially and see that barely 10 drops were in there.. Same for you? I was surprised because given the size of the barrel, I expected it to hold close to the same amount of ink as my Lamy 2000 but it was not the case. The Lamy2k holds a lot compared to this 1912. Is this your first MB? 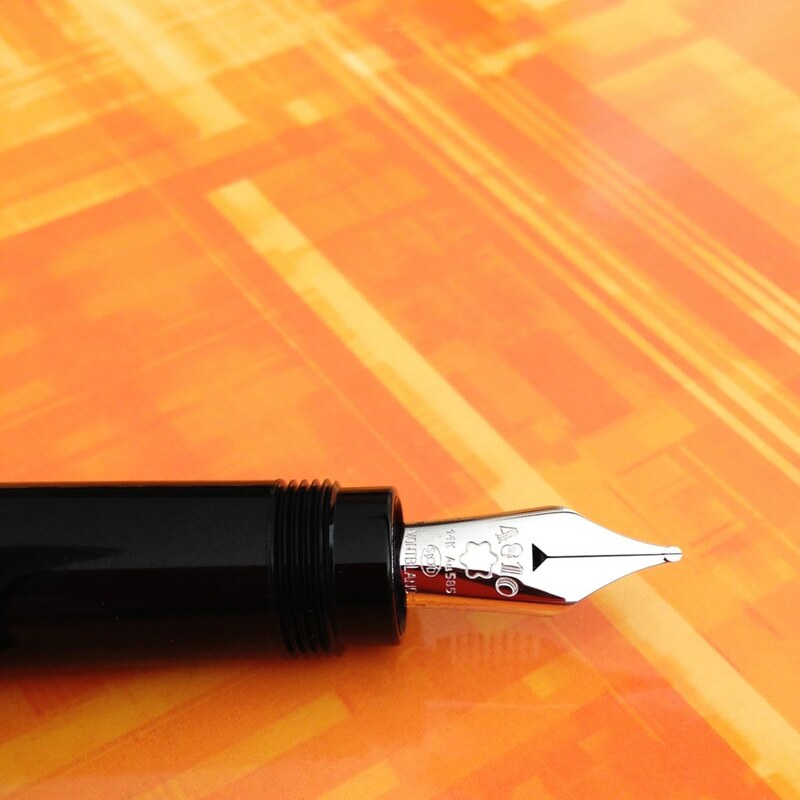 Did you find the medium nib a true western M? 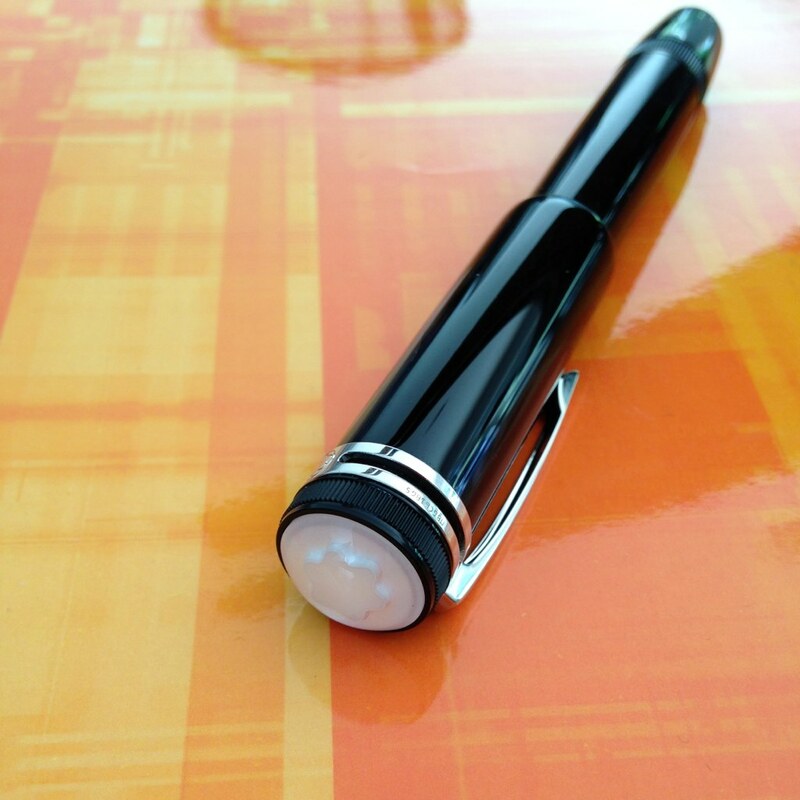 I have always loved the black and platinum pens.........but this thing is DA BIZZNISS!!! OKAY...........you REALLY messed me up this time. I cannot stop looking at and dreaming about this pen! Hey Jack..thanks for stopping by....I have a couple of other MB fountain pens. The Heritage is my favorite right now, though!